We'll broadcast live games at the main arena of Kitakyushu General Gymnasium. 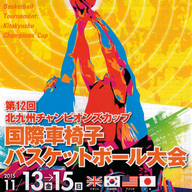 This tournament is competed by international teams from Great Britain, South Korea, America, and Japan. And All-Japan Blocked-Selected Championships and the Elementary School Competition are also held at the same gym.